We went exploring this weekend outside of the Stow (which meant we felt disloyal so we just had to lunch at the Ye Olde Rose and Crown yesterday). Booked a table at a restaurant I had seen a few times called Parioli, but we learnt having walked up and down Lower Clapton Road, E5 that it has a new name, Il Guscio – same phone number! 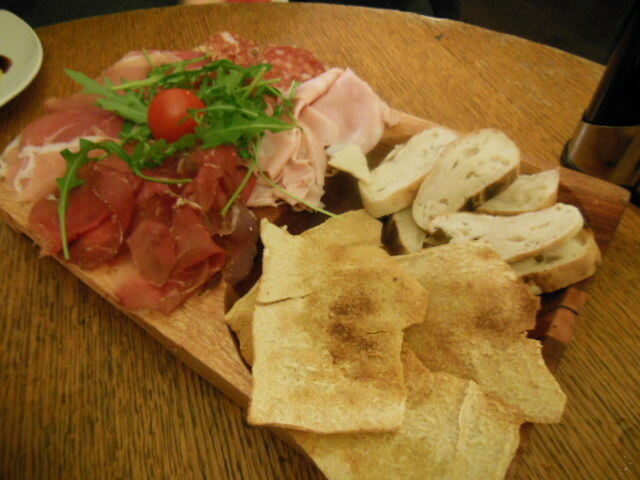 Recommend the Antipasto de Terra board of cured meats, with delicious home made bread and olives, enough to share. Lots of pasta choices on the menu and specials but pizza was the order of the day. They were large, fresh and between £6 -10 each depending on your preference. As a rule I don’t eat bread but it was the other foodies choice so I managed half and took takeaway home. The plain Margherita was perfect but birthday girl had the real deal called Kenze Neke – fresh Italian sausage, Dolcelette and Pecorino. House wine was Sicilian and reasonable at £13 a bottle. Number 48 buses runs past the door back to E17. This entry was posted in Restaurants beyond E17 and tagged E5, Il Guscio, Italian sausage, Lower Clapton, Meat, Parioli, pizza, Sausage. Bookmark the permalink. Sometimes plain and simple is the best – but there’s plenty of foodie adventures on our blog other than pizza!